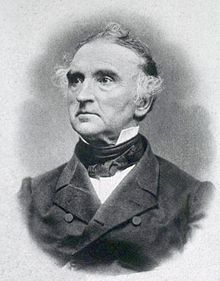 Justus Freiherr von Liebig (12 Mey 1803 – 18 Aprile 1873) wis a German chemist who made major contreibutions tae agricultural an biological chemistry, an was considered the foonder o organic chemistry. ↑ Kumar, Prakash (2012). Indigo plantations and science in colonial India. Cambridge: Cambridge University Press. p. 124. ISBN 9781107023253. Retrieved 4 November 2014. ↑ Royal Society of London (January 1, 1875). "Obituary Notices of Fellows Deceased". Proceedings of the Royal Society of London (1854-1905). 24: xxvii–xxxvii. Retrieved 5 November 2014.